The name of the company from which the services are taken ,along with its postal address and email address . Date and identity code of the invoice for further reference. The name of the customer along with his billing address , phone number, and email address. The list of services availed , like which travelling packages were purchased. The name of the place to be traveled from and the name of the place travelled to. The travelling date and time. The cost per person availing the service. The number of persons availing the service. Other expenses for each of the packages. If the amount is paid by credit card or online transaction, it is also mentioned in the end of the invoice. 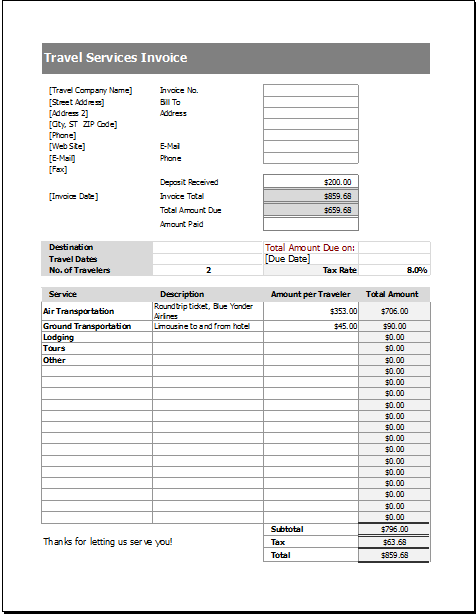 A detailed invoice is very important for a successful travel services business. Every travel service provider should have a well-described service invoice to ensure a successful process and satisfied customers.